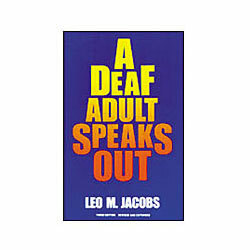 Leo Jacobs has written a unique book about what it is like to be deaf in a hearing world. He speaks out on mainstreaming and its effect on deaf children and the Deaf community, total communication versus oralism, employment opportunities for deaf adults, and public policy toward deaf people. This new edition includes an update of services by and for deaf people, and a chapter on social issues that have had an impact on the Deaf community in the last ten years.